Part of the ethos underpinning South Downs Yarn, Louise Spong’s wool company, is a belief in the importance of making use of locally-available fleece, which can be traced back to the flocks from which it came and sometimes even to the individual sheep. 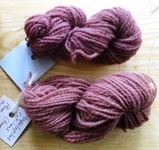 The wool for Louise’s yarn comes from Southdown sheep and is sustainably sourced, single-flock wool from smallholders and farmers from the South Downs locality. 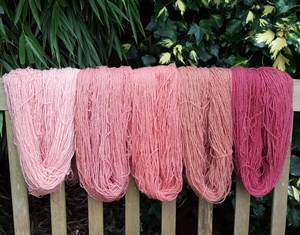 The same ethos determines the sources of the plants used to dye South Downs Yarn, so wherever possible the plants used are grown or harvested locally. This can sometimes be challenging, especially where plant sources of pinks and purples are concerned. Whilst virtually all other colours can be readily produced from locally grown or harvested dyes, pinks and purples are more elusive. Pinks (and also purple) come mainly from the insect dyes, cochineal (found predominantly in parts of Central and South America) and sticklac (from India and South-East Asia). Madder root (Rubia tinctorum) and buckthorn bark (Rhamnus spp.) can sometimes give pinks in the coral range but will rarely give a true rose pink. The most commonly used source of purple is the heartwood of logwood, Haematoxylon campechianum, from South or Central America. 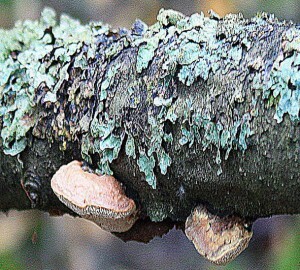 Purple can also be achieved from some species of lichen but lichens are protected in the wild and should preferably not be harvested for dyeing. Lichen purple is also not reliably fast and for that reason I would be reluctant to use this dye for anything I might want to sell or give to anyone else. Alkanet root (Alkanna tinctoria) will give a purple shade under certain conditions but the colours it gives are very variable and not always reliable. Some time ago I discovered by chance another source of purple, when I added some walnut extract to a madder extract dye bath (both extracts from Earthues). This combination produced a pleasing purple-pink but, following further experiments, I found that this only occurs if the dyes are used in extract form and not when the chopped plant dye pieces are used. (See my earlier posts on this. Not what I was expecting & Walnut hulls & madder root again but no purples or pinks) I must conduct some more tests to see whether this colour can be regularly produced from this combination of extract dyes, as it could prove very useful. To try and find other sources of pink and purple, I looked again through my dye sample books and decided to try dyes from fungi, in particular from species of Cortinarius. For this South Downs Yarn fungi dyeing session we used Cortinarius semisanguineus, with an alum mordant and followed by an alkaline modifier. This gave pretty pinks. However, a further alum-mordanted skein followed by a copper modifier after dyeing did not give the purple tones I had hoped for, but a rather dull beige pink. I’m not sure why this was the case but I suspect the exhaust dye bath which we used was too weak to give a pink deep enough to produce the desired result from the copper modifier. I also had the remainder of a small amount of the fungus Hapalopilus rutilans, kindly sent me from Finland by Leena Riihela for some tests for my most recent book A Heritage of Colour, and which gives a pretty lavender purple dye colour. I had read that extracting the colour from Hapalopilus rutilans at pH9 to 10 would improve the colour, so I added a small amount of soda ash to bring the water to pH9 when I simmered the fungus to extract the colour. Unfortunately this proved not to have been such a good idea, as the extracted dye colour seemed paler rather than more intense and pink rather than purple in tone and it dyed the skein a rather pale dull pink. (I had probably also added too much fibre for the amount of dyestuff I had and this made the colour paler than I had wanted. Note to self: Don’t add too much fibre in future when you know there isn’t really sufficient dyestuff for a reasonably strong colour to be achieved, especially when you haven’t got enough dyestuff left to re-dye the fibres!) I re-simmered the used dyestuff together with the last remaining few pieces of fungus and used it to dye two small skeins, which this time became a prettier colour, but still pink in tone. I suspect this was because some soda ash solution had been absorbed by the pieces of fungi and had an effect on the dye bath when the fungus was re-processed. However, as this fungus is not readily available I doubt whether I would be able to obtain enough to make it a useful source of purple. 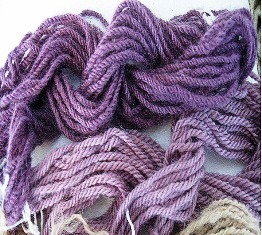 Small skeins dyed in Hapalopilus rutilans after re-simmering the used dyestuff as described above. 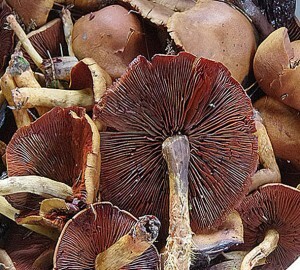 Colours from Hapalopilus rutilans without pH adjustment for colour extraction. The top sample is alum-mordanted & the lower sample is unmordanted. These results indicate that Cortinarius spp. 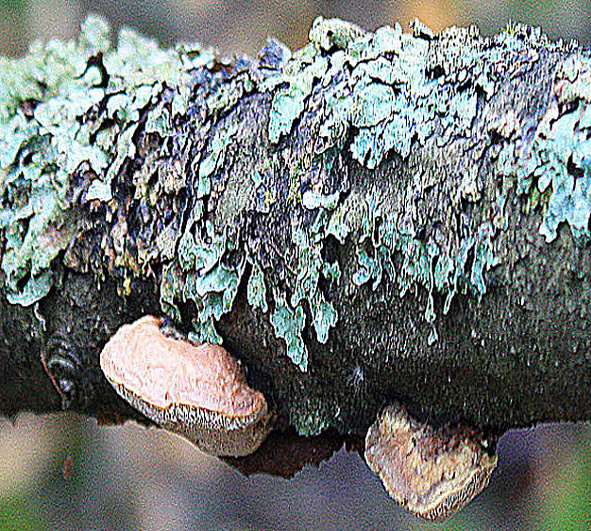 of fungi can be useful sources of pinks. I am also experimenting with the alkaline extraction method on birch bark to see whether this might yield a pink colour. More information about this will follow later.